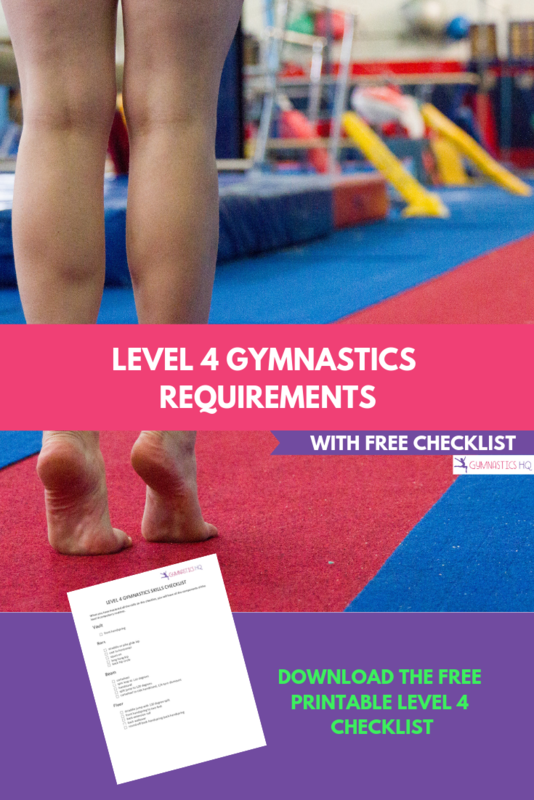 These are the level 4 gymnastics requirements; level 4 is the fourth level in the USA gymnastics level structure. Level 4 is a compulsory level so each gymnast competes the same, identical routine. These are the skills that make up the new compulsory routine. Level 4 is the first required competitive level. Refer to my article outlining the gymnastics levels, for more information on how they work. To compete in level 4 gymnastics a gymnast must be able to do the following skills on each of the four events and have reached her 7th birthday prior to the first competition. I’ve starred the skills that are generally the hardest for gymnasts to learn and most often prohibit a gymnast from moving on to level 4. Once a gymnast can perform all of these skills and she has learned the Level 4 gymnastics compulsory routines, she is ready to compete in a Level 4 meet. After passing out of level 4, gymnasts move on to Level 5. If my daughter competed the old level 5 for two years scoring high enough to compete at state would she be allowed to compete the new level 4? I know it’s an odd question but it’s a long story. She would be allowed to compete either the new level 4 or the new level 5 compulsory levels. The new level 4 would be essentially staying at the same level, so she would probably want to compete the new level 5. I am a gymnast. I used to compete in the level 4 but not anymore since they changed it. Is there any way I can compete in just vault and floor? im excellent at gymnastics —— go check out my instargram @twistinglily_ Promotions ????? You can scratch on an event. 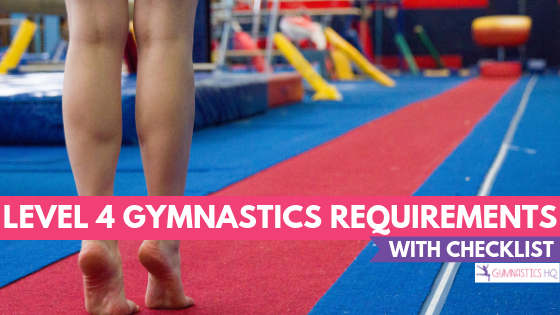 Usually it’s because of injury, or to make a friend not as left out when they scratch(A scratch in gymnastics is when you’re either not there, or you can’t compete in all events, so you present, touch or step onto the apparatus, get off, the present again.) Hope this clears some stuff up! I really want to be a gymnast and I can do a lot of skills but what level are 12 year olds that have been in gymnastics since the age of like 2 usually compete in? It really depends–there are gymnasts of all ages competing at pretty much every level. If you want to be a gymnast, I say go for it! Regardless of age. I have always wanted to be a gymnast. I could be a level 6, floor, if I back tuck my back extension roll. I have never been professionally trained and I am 15. What should I do this point? I think its never too late to take a class! I can do some but not all of these I took an online quiz because we dont have levels at my gym that said i was level 6 or 7 but i cannot even do all the level 4 requirements?! Im on a floor and vault squad by the way. Don’t trust quizzes. If you can do all the requirements for passing out of level 1, you’re a level 2. If you can do that PLUS the requirements for passing out of level 2, you’re a level 3. If you can do the requirements for passing out of level 3, you’re a level 4 and so on and so forth. I did gymnastics for 4 years but my teacher quit when I was 8 so I stopped, I’m at a level 5 floor but haven’t done anything else, I can’t take lessons cause I cannot afford them what should i do? Briana, If you have a YMCA gymnastics program in your area you can talk to them. They offer financial assistance to girls whose families can not afford gymnastics, and this does include competitive teams. I would not recommend practicing at home. It can be dangerous and isn’t going to properly train you to compete in gymnastics. Certified instructors are trained to spot you when you’re learning a new skill as well as teach you how not to get hurt. Also, if you “teach yourself”, then begin training at a gym, you will have o be re-trained in proper technique, making it more difficult to learn the right way to do things. Is there height requirement for the vault table at level 4 meets? My daughter is struggling at a height setting of 2 we dropped down to a 0-1 height and she does great…..trying to get her confidence back. Are we allowed to set the vault at any number we find appropriate? Thank you! Yep, the vault table can be at any height! No one time their was a level 1 11 year old. i am almost 14 and can do level 1 gymnastics. Am i too old to begin level 2 gymnastics? I have loved gymnastics since I was six or seven years old. I stopped classes when I was little and started again this fall. I am on pre-team this semester and will be team in fall 2017. Right now I’m level 4 but I would love to be higher by fall. Do you have any tips? I am a level 4 going in 5 gymnast, but where I live we don’t have very serious gymnastics. I have never done a meet I have only done s,all club floor competitions, my dream is the go to the olympics but I am the on any competition teams, my club doesn’t do them. I went to a club that did do it but they never gave me a chance to show them how good I was, I can do roundoof backhandsoing and nearly an areal, how could I get them to give me a chance to try out for the gymnastics competition team because it is my dream to get in it, but what we were doing was easy stuff for me and we weren’t doing stuff to challenge me? I can do almost everything except the round-off back-handspring back-handspring. Any tips? I really love gymnastics and want to do it. but my question is how much would u say its around for one year, and what can I do if i’m scared to do backhand spring on beam. What level am I? Please help or respond! Thanks! Glitteryunicorncupcake, quizzes aren’t necessarily that accurate. I’m a gymnast and I think you should probably be in level 3 or 4 (sorry to disappoint). In USAG you would be in level 3 and only move up once you get your round off back handspring, or in WAG you could be in level 4. Hope this helps! You would be around a level two gymnast or on a developmental team based on USAG requirements. If you are looking to join xcel groups you would be in xcel bronze. I love gymnastics! A quiz said I’m level 5 but I can’t do a kip, front hip circle, giant or more than 1 back hip circle! Is the quiz fibbing or telling the truth? Please help or respond! Thanks! Hey, I was in level four a year ago but I got a bad leg injury that got me out of gymnastics for a while and I always really wanted to compete in the Olympics when I’m older. I’m 14 now and I was wondering if it isn’t too late to continue? and if its possible to still learn more things. It’s not to late I am 12 and I’m only a level 2 go for your dreams no matter what!!! 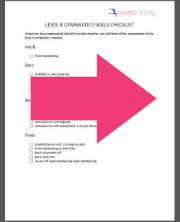 im moving to a different gymnastics and i only need 2 more skills for level 5 but i have summer training to learn the, is it possible to skip level 4? it depends but you might want to get those skills because they might help later on. My daughter just moved up to level 4. At level 3, she was doing 10.5 hours but now sge will be training fir 16 hrs per wk. My question to you is…what is the usag required hours of training for this level? I can do a cartwheel round off forward and backward roll a 30-60 and kind of 90 degree split jumps on beam never been on bar or vault what level am I? you might want to try level 2 so you can learn vault and bars. Hi. I’m a level 2 but I can do everything except my mill circle. I can even do some of the level 3 stuff. Is it possible that I could advance to level 3 before my meet? I’m Kate and i’m 10. I’m level 4 but I feel like other kids my age are ahead of me. My coach say I’m where I should be but I don’t think so. Hi!!! Most people that are younger and more advanced started when they were super young! Also they most likely had special training…. Keep doing what you’re doing and you’ll advance!!! can i skip level 3 (without competing) and go to level 4? I’m a level 3-ish and I really REALLY need to get to level 6 in a year for personal reasons. Does anyone have any tips for advancing quickly? I am 13 and I have been doing self taught tumbling for like my whole life. I can do a Back and front walkover, cartwheel, back tuck, I’m a dancer but I really want to become a gymnast. Is it ever too late to join gymnastics? It is never too late to start gymnastics! But, have realistic goals and think about the gym you decide to go to… if you’d still like a chance at competing internationally at the elite level you’re going to have to work very very hard and a good gym can help with that! Can a gymnast be in xcel and switch to compulsory levels? Also can you skip level four and go straight to five, if so what/ how would you do so? MY daughter is 7 years old and has skills for level 5-6! Can she skip level 4 once she has competed in one meet scoring enough for state?? No, a gymnast MUST compete a whole season at the least, of level four gymnastics before level five. But once in level five, they will compete one sanctioned meet And if get a 33 AA or higher they atamaticlly become a level six after that one meet. Hey, I am 13, and I want to start gymnastics, and can do a front handspring, front walkover and more. But not a back handspring. Is it too late to start? I am afriaid I will embarrass myself. Hi Maria, the only tip you can really give for backhandsprings is to just go for it. It is going to seem scary at first but we promise that once you’ve done it once, you’ll have the confidence. Just believe in yourself. As long as you can do 5 press-ups, your arms won’t collapse so don’t worry about going backwards and falling. If this doesn’t work and you don’t have self confidence then you can always stack up pillows beneath your head and slowly remove them until there are none left. You should tell your coaches how you feel and how badly you want to compete to help them understand it from your point of view. Show your coaches that you can do everything amd prove yourself to them. Hey, I have been doing gymnastics since I was 7 years old I did rec classes till I was 11 witch this year I just joined team. They put me in level 3 I have gotten all my level 3 skills and I have all my level 4 skils except a kip and a squat on I really want to at least get to work with the 4s because I’m older then everyone on my team and I get really embarrassed so if u have any advice let me know! Okay soo… I am turning 11 and right now I am at a pre-team at my gym. We don’t compete yet and I really want to. I was looking into another gym. At that gym, I could move up to a Xcel Gold. But, at my gym, I really like my coach. What should I do? Also, I am working on a back handspring. This would be in about a year… just wondering. PLEASE RESPOND! Hi Annie, We’re sure you’ve made your decision by now and hope everything worked out for the best! Good luck! I can do all of the skills up to level 3 on beam,floor,and vault, but I can only do level one skills on bars with a light spot. So what level would I be in? Hi Christy, You would not be considered a level 3 until you can get all the required level 3 skills on bars. Definitely talk to your coach to figure out what level you should be in. If you love gymnastics then you it doesn’t matter how old you are!! I started gymnastics when I was 10, and now I’m 13. I’ve been thinking about trying out for competitive, but I’m not sure if I’m ready because I can’t do some of the level 3 and 4 skill requirements, and I also think it’s a bit embarrassing to tryout since I’m 13. I’ve seen kids tryout for competitive and all look like they are ages 7-10. I really love the sport and I can’t imagine myself quitting, so why not tryout now before I’m too old? Please help, I’m really confused!!! Im a 11 year old gymnast who’s got everything that I need for level 2 gymnastics. I am in recreational gymnastics but I want to move up to competition BADLY. My coaches just don’t see that I have got the required skills to make it to level two competition. Everything on the checklist has been ticked off. Please help me because I really want it badly and don’t know what to do. Also, how do you get over the fear of back handsprings? However much I try I am too scared to fall back. I’m almost 12, and I started gymnastics when I was 3 but then stopped for 5 years (because of a move). I started back again when I was 8 and I have been going, but recently I stopped going (I really don’t know why). Its been about 3 months since I’ve gone back to the gym, but I can still do most of my skills. Is that bad, that I’m not going to gymnastics? Also, I have been in recreational gymnastics. At the age of 12… Is that bad? Hi Gracie, it all depends on your goals. If you love gymnastics and want to do recreational gymnastics because it’s fun then you should do it. Hi! There are many gymnasts who are older and taller than other gymnasts in their level. If you love gymnastics then you should pursue it.